First of all: How fun was the Superbowl on Sunday?!! What a game! I posted lots of Cuisinicity goodies in the making on my instagram feed, so go check them out if you haven’t already! …and my son Gabe and his wonderful sweetie, Julia, did the same in their college dorm….aren’t they SOOOOOO CUTE?!! I would still love for any of you wonderful cuisinicity fans out there who got up to dance to send me clips of your dancing at half-time or anytime and if you are OK with it, I would love to post it right here!! This week, back by popular demand, I am bringing back my Simply collection that takes simplicity to a whole other level…where less is more! 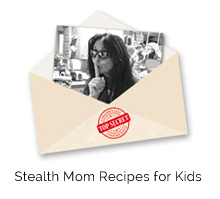 In fact, when I first introduced this line of recipe, I was almost embarrassed to call these special recipes, ACTUAL recipes, precisely because they are so simple. As it turns out, I didn’t need to be. The overwhelming feedback that I received from all of you was so positive that I decided to honor your request for an encore! You loved the wholesomeness and purity of the ingredients, you loved the fullness of their flavors and you loved the ease of it all–So I am delighted to oblige! 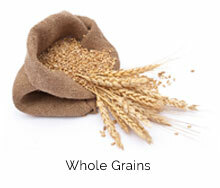 In this little collection of Simply this and Simply that, I choose whole foods that “speak” for themselves. These wholesome ingredients in their simplest naked form, just need a little accent, or just a little “push” from me, be it with an herb or a spice or a drizzle of extra virgin olive oil, or even just the special way that I roast, or grill or sautée them to bring out their full flavor and just let them “take over”. What’s nice for me and for you is that, because these simply recipes basically make themselves, there is no fuss involved and I LOVE that! Apparently, you do too! So it is, that I bring back… my Simply collection of recipes and add a few new ones for you! 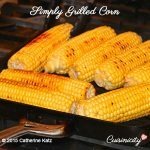 Simply Grilled Corn: I love grilling fresh corn and then roast it in a hot oven. 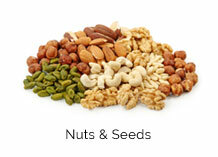 It gives the kernels that wonderful fire-roasted taste. Definitely no need for butter here! 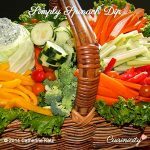 Simply Spinach Dip: I don’t understand why it tastes so rich! it’s basically fat free Greek yogurt and a “ton”of fresh baby spinach. So delicious and so very simple! 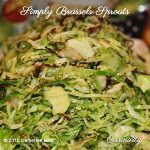 Simply Brussel Sprouts: All this entails is slicing these little sprouts thinly with a food processor or a mandoline and sautéing them in a little olive oil. They become almost caramelized and the result is extraordinary, really! 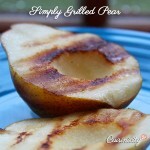 Simply Grilled Pears: Pick a ripe juicy pear, grill it with a drizzle of olive oil and you can transform a simple fresh salad into a delightful elegant dish! 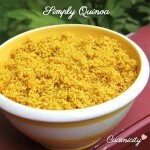 Simply Quinoa: It’s not fancy! it’s the no fuss, full-proof, always perfectly cooked, not mushy, fluffy, yummy wholegrain accompaniment to any dish and it takes all of 8 minutes to get on the table! 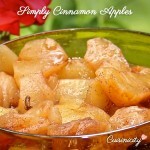 Simply Cinnamon Apples: These apples are nestled together in a small pot with just a drop of water and simmer for 15 minutes so that the apples release their own moisture and create their own sweet condensed juice, almost caramelized. 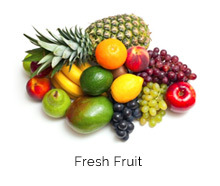 They keep their full flavor that way and there is no need to add sugar! 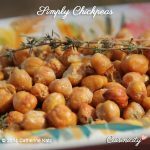 Simply Chickpeas: I love an excuse to use chickpeas! 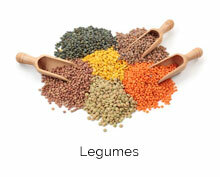 This is a little legume with a mission, I tell you! It’s filled with nutrients. In this simple recipe, I just bake them in a high temperature oven with a little olive oil and spices and they make for a great appetizer! 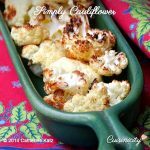 Simply Cauliflower: As advertised, really simple! The only “trick” here is to transfer the cauliflower florets onto a preheated baking sheet so that they do not get soggy. I add just a little bit of finely grated asiago cheese to give it that great savory taste, oh so good! 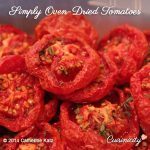 Simply Oven-Dried Tomatoes: They are the next best thing to drying tomatoes under the Tuscan sun! They burst with flavor and are a cinch to make. I don’t even add olive oil, there is no need! The only trick is to have the time to forget about them in a very low oven for a few hours. They are wonderful as appetizers with a little goat cheese sprinkled on them, or simply naked, as a side dish. 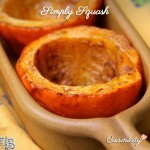 Simply Squash: What can I say? YUM and filled with fiber! Acorn squash is so pretty too, it looks like a little mini pumpkin–absolutely beautiful as a healthy side dish and so delicious and sweet! 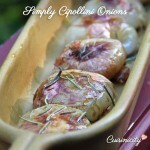 Simply Cipollini Onions: Their name means “little onion” in Italian, and indeed they are! They are so sweet and tender and lend themselves perfectly to this simple way of preparing them because they caramelize so easily. 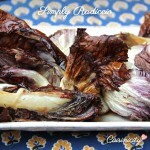 Simply Radicchio: As always, I love a great excuse to add another veggie to my dining repertoire! I personally love radicchio but it is true that it can taste a little bitter to some. I find that baking it this way makes it a little sweeter and is a lovely way to use it as a side dish. 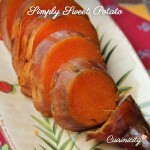 Simply Sweet Potato: Sweet potatoes are so delicious prepared this way because they release their own moisture inside the aluminum foil and create their sweet condensed juice so that when you unwrap them, they are glistening and moist. 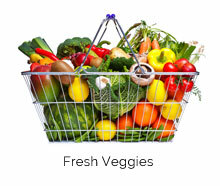 Simply Grilled veggies: Just a simple “trick” to grill any and all vegetables! 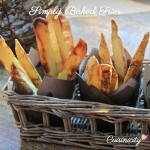 Simply Baked Fries:These are crisp and delicious without all the frying! 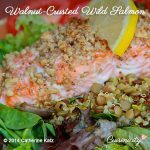 Walnut-Crusted Salmon: just 2 ingredients: Wild salmon + Walnuts= nutrition power couple and just exquisite. 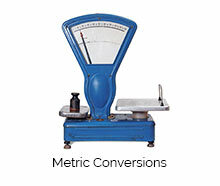 Your guests will definitely think you labored over this, but no need to tell them how easy this is! 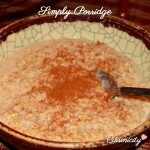 Simply Porridge: You know those cold mornings when you get up and just crave a warm, creamy, yummy-in-the-tummy, feel-good breakfast to get you started for the day? Well, if you know what I mean, then this is the porridge for you! From beginning to end: 15 minutes! 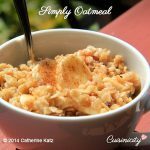 Simply Oatmeal: is just a classic breakfast that I make from scratch on a busy morning. It literally takes 4 minutes. I think you can tell that I love every one of the recipes that I deem worthy of Cuisinicity, I truly do! I have carefully thought out and created each and every one of them and crafted them over the years with love and determination and at times, frustration (I can’t tell you how many failed attempts ended in my trash along the way, as the dirty dishes piled up in my sink nonetheless)...but this new “simply” collection just makes me singularly proud because I feel it’s a true advocate for the best, most wholesome, ingredients we need more of, in our diet for good health. So, I would like to thank you all, in turn, for simply asking for more! This is SO, SO TRUE Catherine…simple and wholesome cooking is often the best way to go. I often fall back on those simple recipes. 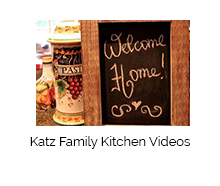 I will soon try your walnut-crusted salmon recipe! Looks so yummy! Oh my goodness Julie you are going to LOOOOOVE the salmon prepared this way, I know it! 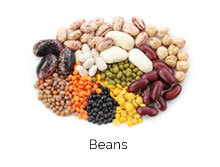 So simple, so nutritious and just plain delicious! can’t wait for you to try and tell me just that!!! merci Martine! 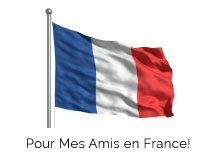 Vous parlez vraiment bien l’anglais, c’est formidable!!! 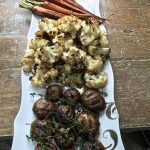 Your Simply Cauliflower recipe could not be “simpler” yet I never thought to combine asiago cheese with cauliflower!! Can’t wait to try this week!! I can’t wait Caroline! let me know how you love it!!! Much appreciated! ♡ I was most excited to see both of my favorite Dr. Katzes on IIN’s speaker list this weekend. I’ll be attending the conference from Friday evening til 2pm Sunday. The presentation schedule is not yet posted, so I have my fingers crossed that I’ll be there in person to absorb your words of wisdom and reflect back all of your vibrant positive energy! Catherine, I so appreciate how Cuisinicity, and especially your ‘simply’ recipes, demystify fine cooking. 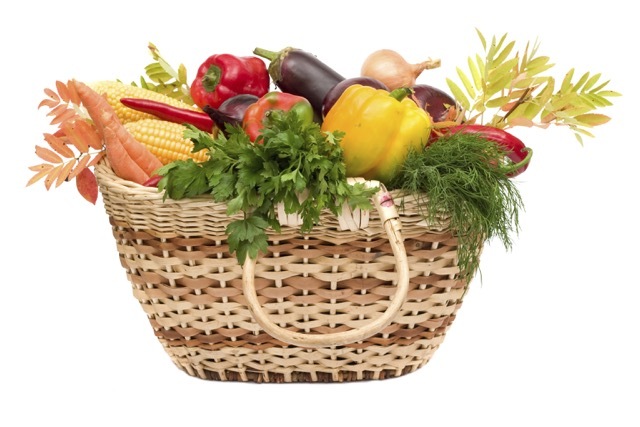 Thank you for making nutritious, delicious meals so accessible for today’s busier- than-ever families! Thank you so much Kimmell! Coming from you, it means so much! I love your work too! I’m a great fan of simple!!! 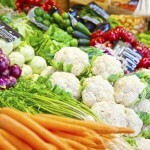 Especially in the kitchen when I’m more often than not rushing – being able to put a healthy meal on the table – with simple ingredients – an easy to follow recipe – is worth its weight in gold (or is that calories!) Thanks Catherine – you’ve done it again! Yay, my poetlady, I know you know first hand what busy means so I am glad I can help a little! Thank you so much!! YES!! Barbara, my feeling exactly!! Thank you for the kind words! I love it!